I am attaching pictures of the notes, hope you can see them Ok, had to resize them quite a bit. They look to be quite nice. You can send better pics to the main email address. The B Series £50 is a scarce replacement note, a pity that it is damaged. 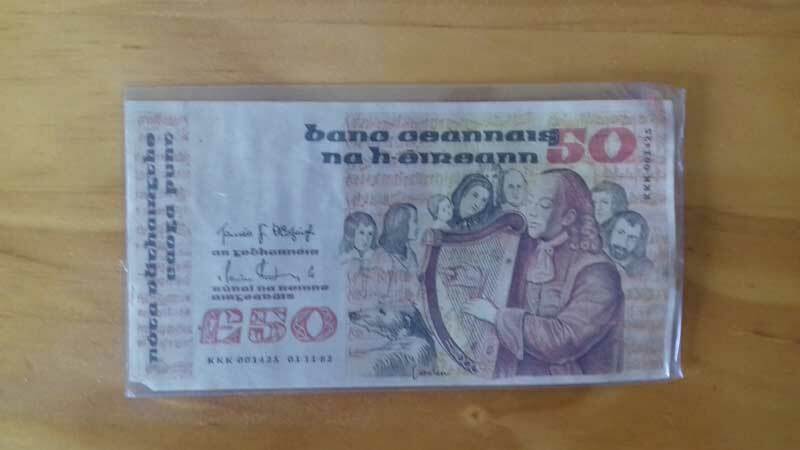 The £100, £50 Lavery notes would be worth at least 300 euro each, more if they are nice, up to 1000 Euro if in high grade. The £20 would be worth a couple of hundred if it doesn't have any creases. These are in fact colour copies, currently being sold on ebay as 'colour copies'. In legal terms they are forgeries, as the A Series notes are still redeemable. Ok, thank you. I have taken some out of their sleeves, however the only ones I couldn't take out where the £10 and the £1. 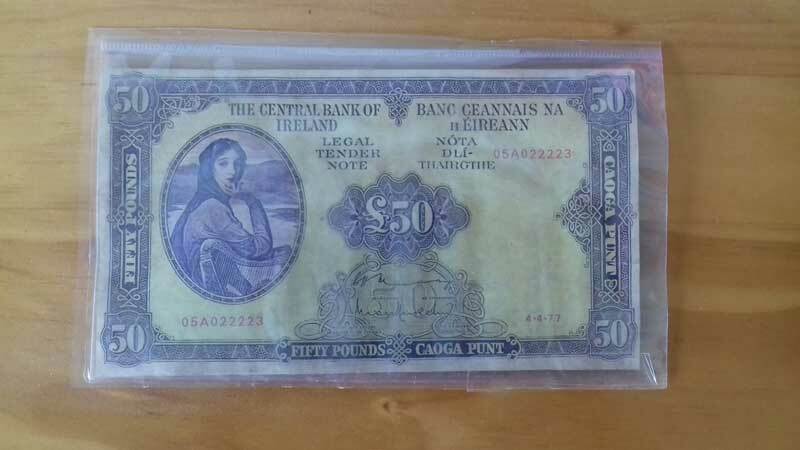 The scarce £50 with the tear unfortunately doesn't have the part that has been torn off. I will send the clearer pictures of the others which I have taken out of the sleeves to the main email address. Mac, I want to buy a Lady Lavery £100 note, and there is one in Good (G4) condition on Adverts for €165. It also has writing on the back, and a few edge nicks. Also it's dated 1975. How much should I expect to pay for it? Also, I bought a £10 note dated 1990 on eBay in Unc? condition for €28, and it has significant edge wrinkles, small border ink mark, and rather large corner fold, and may have been pressed. Know the value? Most sellers on ebay do not use the grading terms accurately. Some sellers neglect to mention that a note has been cleaned, even though it may be obvious. A few current ebay sellers (three with active listings today) are likely actively cleaning notes. Most ebay sellers are sound though. I had a look at that £100. It hasn't been messed with or washed. That tenner you describe is worth just its face value in that condition. You should ask for a refund, as by ebay rules if the description is not accurate you are entitled to return the item. Your rights of return are also covered by consumer rights legislation. In general, Mac, are soiled, torn, or scribbled-on notes worth only face value? Series B notes wrote: In general, Mac, are soiled, torn, or scribbled-on notes worth only face value? 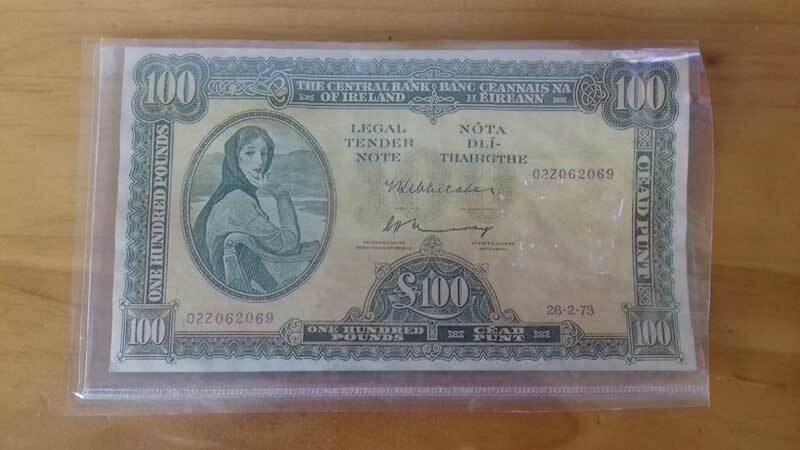 That would be the case with more recent Irish notes, unless they are rare. 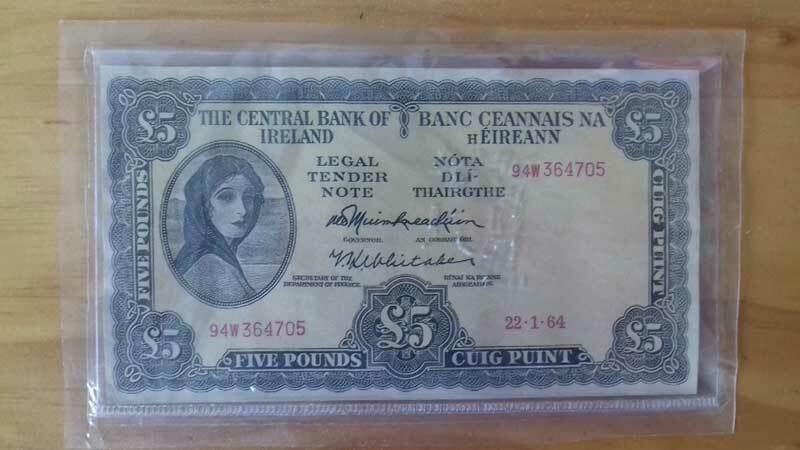 Pre-1961 Irish notes tend to have some added value even in very low grade. 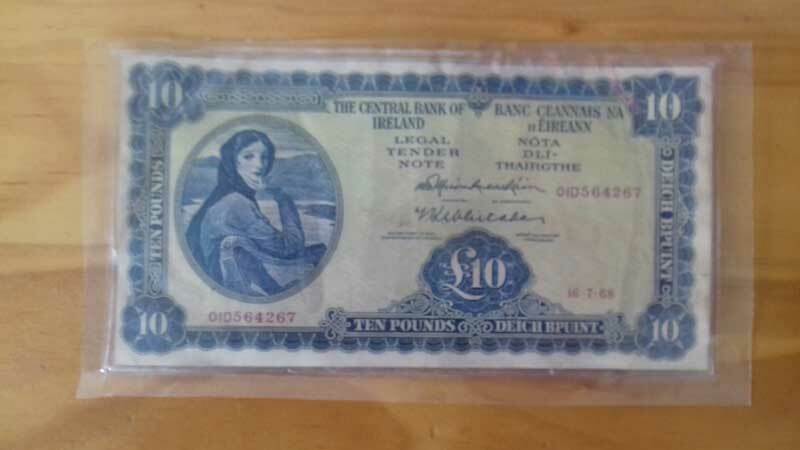 10/-, £20, £50, £100 Lavery notes will also often have a premium on them even in very low grade. 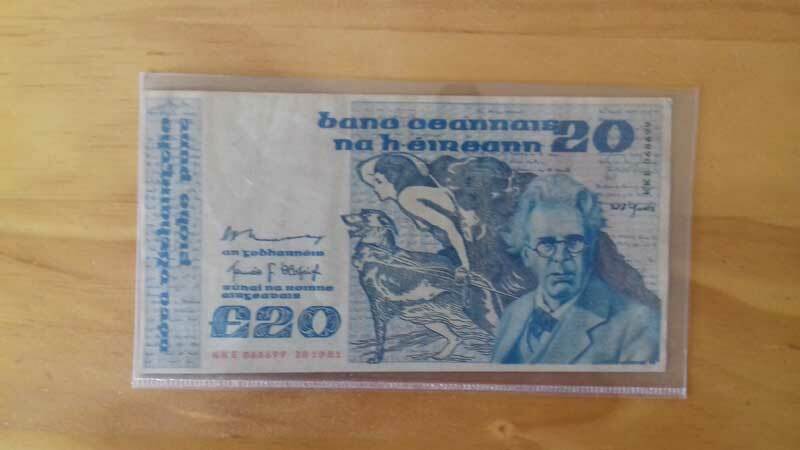 I have two WB Yeats 20 pound notes and was wondering what their value would be.They are very clean.No damaged corners or pen marks and no fold marks.They are dated 18 /11/87 one has an IEL serial number and the other one has a LEI serial number.They are circulated notes but are in very nice condition.I can't seem to be able to upload photos as it keeps telling me file is too big. They have no folds at all and no marks. Hmmm.... But if they are circulated, wouldn't they have folds? Can't really do a valuation without seeing them. Try taking a pic at your camera, or scanner's lowest setting. File needs to be samll fo upload. Most of these notes are worth around 50 Euro each in they are average VF grade. A new note would be worth around twice that. Think I got my money's worth? Last edited by Series B notes on 16 Oct 2017 01:16, edited 1 time in total. Series B notes wrote: Think I got my money's worth? 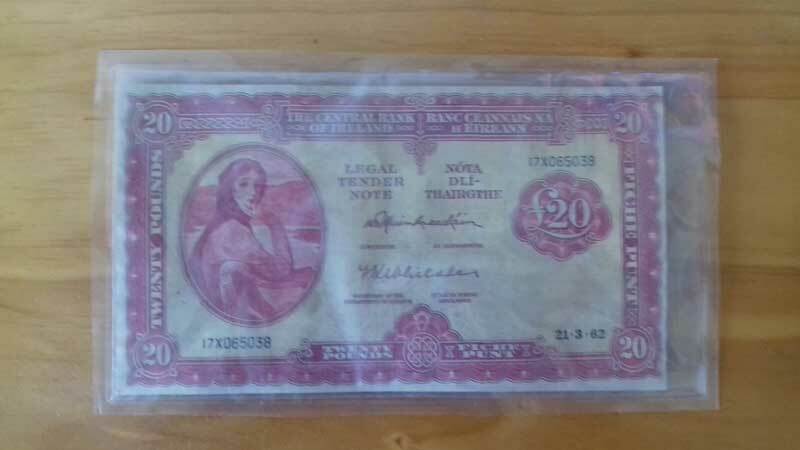 I sell notes of that era in that grade for about 20 Euro. I'm sorry, I just cannot post pictures for some reason. Here goes the description again: 2 light central creases, some handling, I would say XF. Value in this grade is above 20 euros? Or actually, make that GVF instead of XF. Series B notes wrote: I'm sorry, I just cannot post pictures for some reason. There is a 250k size limit on posting images. GVF is about right for this, quite a nice example of a 1960 £1. 1960 is a tough year to get in better than VF grade. I'd say you did ok on that one. Mac, would you say A/B/C series replacement notes in very low grades (i.e. VG and below) carry a premium? Yes. There are lots of date collectors for these. How much of a premium would depend on how many notes of a particular date or type are available in UNC, or high grade. 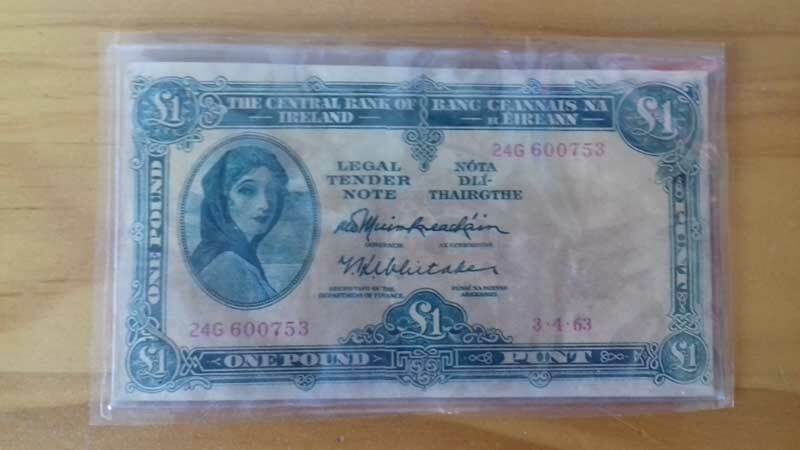 You said earlier that 10/-, 20, 50, and 100 pound Lady Lavery notes usually have a premium, even in very low grade? What about the most common date in Poor grade? Any premium there?